A comparison of some "EDO" equal temperament scales. The graph spans one octave horizontally (open the image to view the full width), and each shaded rectangle is the width of one step in a scale. The just interval ratios are separated in rows by their prime limits. An equal temperament is a musical temperament, or a system of tuning, in which the frequency interval between every pair of adjacent notes has the same ratio. In other words, the ratios of the frequencies of any adjacent pair of notes is the same, and, as pitch is perceived roughly as the logarithm of frequency, equal perceived "distance" from every note to its nearest neighbor. In equal temperament tunings, the generating interval is often found by dividing some larger desired interval, often the octave (ratio 2:1), into a number of smaller equal steps (equal frequency ratios between successive notes). 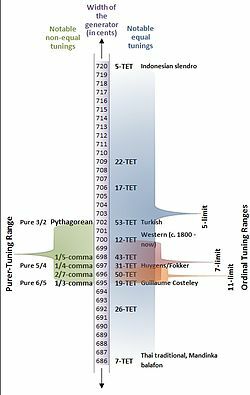 In classical music and Western music in general, the most common tuning system since the 18th century has been twelve-tone equal temperament (also known as 12 equal temperament, 12-TET or 12-ET), which divides the octave into 12 parts, all of which are equal on a logarithmic scale, with a ratio equal to the 12th root of 2 (12√2 ≈ 1.05946). That resulting smallest interval, ​1⁄12 the width of an octave, is called a semitone or half step. In modern times, 12TET is usually tuned relative to a standard pitch of 440 Hz, called A440, meaning one note, A, is tuned to 440 hertz and all other notes are defined as some multiple of semitones apart from it, either higher or lower in frequency. The standard pitch has not always been 440 Hz. It has varied and generally risen over the past few hundred years. Other equal temperaments divide the octave differently. For example, some music has been written in 19-TET and 31-TET. Arabic music uses 24-TET as a notational convention. In Western countries the term equal temperament, without qualification, generally means 12-TET. To avoid ambiguity between equal temperaments that divide the octave and those that divide some other interval (or that use an arbitrary generator without first dividing a larger interval), the term equal division of the octave, or EDO is preferred for the former. According to this naming system, 12-TET is called 12-EDO, 31-TET is called 31-EDO, and so on. An example of an equal temperament that finds its smallest interval by dividing an interval other than the octave into equal parts is the equal-tempered version of the Bohlen–Pierce scale, which divides the just interval of an octave and a fifth (ratio 3:1), called a "tritave" or a "pseudo-octave" in that system, into 13 equal parts. Unfretted string ensembles, which can adjust the tuning of all notes except for open strings, and vocal groups, who have no mechanical tuning limitations, sometimes use a tuning much closer to just intonation for acoustic reasons. Other instruments, such as some wind, keyboard, and fretted instruments, often only approximate equal temperament, where technical limitations prevent exact tunings. Some wind instruments that can easily and spontaneously bend their tone, most notably trombones, use tuning similar to string ensembles and vocal groups. The two figures frequently credited with the achievement of exact calculation of equal temperament are Zhu Zaiyu (also romanized as Chu-Tsaiyu. Chinese: 朱載堉) in 1584 and Simon Stevin in 1585. According to Fritz A. Kuttner, a critic of the theory, it is known that "Chu-Tsaiyu presented a highly precise, simple and ingenious method for arithmetic calculation of equal temperament mono-chords in 1584" and that "Simon Stevin offered a mathematical definition of equal temperament plus a somewhat less precise computation of the corresponding numerical values in 1585 or later." The developments occurred independently. Kenneth Robinson attributes the invention of equal temperament to Zhu Zaiyu and provides textual quotations as evidence. Zhu Zaiyu is quoted as saying that, in a text dating from 1584, "I have founded a new system. I establish one foot as the number from which the others are to be extracted, and using proportions I extract them. Altogether one has to find the exact figures for the pitch-pipers in twelve operations." Kuttner disagrees and remarks that his claim "cannot be considered correct without major qualifications." Kuttner proposes that neither Zhu Zaiyu or Simon Stevin achieved equal temperament and that neither of the two should be treated as inventors. The origin of the Chinese pentatonic scale is traditionally ascribed to the mythical Ling Lun. Allegedly his writings discussed the equal division of the scale in the 27th century BC. However, evidence of the origins of writing in this period (the early Longshan) in China is limited to rudimentary inscriptions on oracle bones and pottery. A complete set of bronze chime bells, among many musical instruments found in the tomb of the Marquis Yi of Zeng (early Warring States, c. 5th century BCE in the Chinese Bronze Age), covers five full 7-note octaves in the key of C Major, including 12 note semi-tones in the middle of the range. An approximation for equal temperament was described by He Chengtian, a mathematician of Southern and Northern Dynasties around 400 AD. He came out with the earliest recorded approximate numerical sequence in relation to equal temperament in history: 900 849 802 758 715 677 638 601 570 536 509.5 479 450. Historically, there was a seven-equal temperament or hepta-equal temperament practice in Chinese tradition. (12√2)84 = 27 = 128. According to Gene Cho, Zhu Zaiyu was the first person to solve the equal temperament problem mathematically. Matteo Ricci, a Jesuit in China recorded this work in his personal journal and very likely brought it back to the West. In 1620, Zhu's work was referenced by a European mathematician. Murray Barbour said, "The first known appearance in print of the correct figures for equal temperament was in China, where Prince Tsaiyü's brilliant solution remains an enigma." The 19th-century German physicist Hermann von Helmholtz wrote in On the Sensations of Tone that a Chinese prince (see below) introduced a scale of seven notes, and that the division of the octave into twelve semitones was discovered in China. Zhu Zaiyu illustrated his equal temperament theory by the construction of a set of 36 bamboo tuning pipes ranging in 3 octaves, with instructions of the type of bamboo, color of paint, and detailed specification on their length and inner and outer diameters. He also constructed a 12-string tuning instrument, with a set of tuning pitch pipes hidden inside its bottom cavity. In 1890, Victor-Charles Mahillon, curator of the Conservatoire museum in Brussels, duplicated a set of pitch pipes according to Zhu Zaiyu's specification. He said that the Chinese theory of tones knew more about the length of pitch pipes than its Western counterpart, and that the set of pipes duplicated according to the Zaiyu data proved the accuracy of this theory. One of the earliest discussions of equal temperament occurs in the writing of Aristoxenus in the 4th century BC. Vincenzo Galilei (father of Galileo Galilei) was one of the first practical advocates of twelve-tone equal temperament. He composed a set of dance suites on each of the 12 notes of the chromatic scale in all the "transposition keys", and published also, in his 1584 "Fronimo", 24 + 1 ricercars. He used the 18:17 ratio for fretting the lute (although some adjustment was necessary for pure octaves). Galilei's countryman and fellow lutenist Giacomo Gorzanis had written music based on equal temperament by 1567. Gorzanis was not the only lutenist to explore all modes or keys: Francesco Spinacino wrote a "Recercare de tutti li Toni" (Ricercar in all the Tones) as early as 1507. In the 17th century lutenist-composer John Wilson wrote a set of 30 preludes including 24 in all the major/minor keys. Henricus Grammateus drew a close approximation to equal temperament in 1518. The first tuning rules in equal temperament were given by Giovani Maria Lanfranco in his "Scintille de musica". Zarlino in his polemic with Galilei initially opposed equal temperament but eventually conceded to it in relation to the lute in his Sopplimenti musicali in 1588. The first mention of equal temperament related to the twelfth root of two in the West appeared in Simon Stevin's manuscript Van De Spiegheling der singconst (ca. 1605), published posthumously nearly three centuries later in 1884. However, due to insufficient accuracy of his calculation, many of the chord length numbers he obtained were off by one or two units from the correct values. As a result, the frequency ratios of Simon Stevin's chords has no unified ratio, but one ratio per tone, which is claimed by Gene Cho as incorrect. A generation later, French mathematician Marin Mersenne presented several equal tempered chord lengths obtained by Jean Beaugrand, Ismael Bouillaud, and Jean Galle. In 1630 Johann Faulhaber published a 100-cent monochord table, which contained several errors due to his use of logarithmic tables. He did not explain how he obtained his results. From 1450 to about 1800, plucked instrument players (lutenists and guitarists) generally favored equal temperament, and the Brossard lute Manuscript compiled in the last quarter of the 17th century contains a series of 18 preludes attributed to Bocquet written in all keys, including the last prelude, entitled Prelude sur tous les tons, which enharmonically modulates through all keys. Angelo Michele Bartolotti published a series of passacaglias in all keys, with connecting enharmonically modulating passages. Among the 17th-century keyboard composers Girolamo Frescobaldi advocated equal temperament. Some theorists, such as Giuseppe Tartini, were opposed to the adoption of equal temperament; they felt that degrading the purity of each chord degraded the aesthetic appeal of music, although Andreas Werckmeister emphatically advocated equal temperament in his 1707 treatise published posthumously. Twelve-tone equal temperament took hold for a variety of reasons. It was a convenient fit for the existing keyboard design, and permitted total harmonic freedom at the expense of just a little impurity in every interval. This allowed greater expression through enharmonic modulation, which became extremely important in the 18th century in music of such composers as Francesco Geminiani, Wilhelm Friedemann Bach, Carl Philipp Emmanuel Bach and Johann Gottfried Müthel. A precise equal temperament is possible using the 17th-century Sabbatini method of splitting the octave first into three tempered major thirds. This was also proposed by several writers during the Classical era. Tuning without beat rates but employing several checks, achieving virtually modern accuracy, was already done in the first decades of the 19th century. Using beat rates, first proposed in 1749, became common after their diffusion by Helmholtz and Ellis in the second half of the 19th century. The ultimate precision was available with 2-decimal tables published by White in 1917. In musical analysis, material belonging to an equal temperament is often given an integer notation, meaning a single integer is used to represent each pitch. This simplifies and generalizes discussion of pitch material within the temperament in the same way that taking the logarithm of a multiplication reduces it to addition. Furthermore, by applying the modular arithmetic where the modulus is the number of divisions of the octave (usually 12), these integers can be reduced to pitch classes, which removes the distinction (or acknowledges the similarity) between pitches of the same name, e.g. c is 0 regardless of octave register. The MIDI encoding standard uses integer note designations. This interval is divided into 100 cents. The intervals of 12-TET closely approximate some intervals in just intonation. The fifths and fourths are almost indistinguishably close to just intervals, while thirds and sixths are further away. In the following table the sizes of various just intervals are compared against their equal-tempered counterparts, given as a ratio as well as cents. Violins, violas and cellos are tuned in perfect fifths (G – D – A – E, for violins, and C – G – D – A, for violas and cellos), which suggests that their semi-tone ratio is slightly higher than in the conventional twelve-tone equal temperament. Because a perfect fifth is in 3:2 relation with its base tone, and this interval is covered in 7 steps, each tone is in the ratio of 7√​3⁄2 to the next (100.28 cents), which provides for a perfect fifth with ratio of 3:2 but a slightly widened octave with a ratio of ≈ 517:258 or ≈ 2.00388:1 rather than the usual 2:1 ratio, because twelve perfect fifths do not equal seven octaves. During actual play, however, the violinist chooses pitches by ear, and only the four unstopped pitches of the strings are guaranteed to exhibit this 3:2 ratio. Play (help·info) cent steps respectively, are fairly common. A Thai xylophone measured by Morton (1974) "varied only plus or minus 5 cents," from 7-TET. According to Morton, "Thai instruments of fixed pitch are tuned to an equidistant system of seven pitches per octave ... As in Western traditional music, however, all pitches of the tuning system are not used in one mode (often referred to as 'scale'); in the Thai system five of the seven are used in principal pitches in any mode, thus establishing a pattern of nonequidistant intervals for the mode." A South American Indian scale from a pre-instrumental culture measured by Boiles (1969) featured 175-cent seven-tone equal temperament, which stretches the octave slightly as with instrumental gamelan music. 5-TET and 7-TET mark the endpoints of the syntonic temperament's valid tuning range, as shown in Figure 1. In 5-TET the tempered perfect fifth is 720 cents wide (at the top of the tuning continuum), and marks the endpoint on the tuning continuum at which the width of the minor second shrinks to a width of 0 cents. In 7-TET the tempered perfect fifth is 686 cents wide (at the bottom of the tuning continuum), and marks the endpoint on the tuning continuum, at which the minor second expands to be as wide as the major second (at 171 cents each). Easley Blackwood's notation system for 16 equal temperament: intervals are notated similarly to those they approximate and there are fewer enharmonic equivalents. Comparison of equal temperaments from 9 to 25 (after Sethares (2005), p.58). 24 EDO, the quarter tone scale (or 24-TET), was a popular microtonal tuning in the 20th century probably because it represented a convenient access point for composers conditioned on standard Western 12 EDO pitch and notation practices who were also interested in microtonality. Because 24 EDO contains all of the pitches of 12 EDO, plus new pitches halfway between each adjacent pair of 12 EDO pitches, they could employ the additional colors without losing any tactics available in 12-tone harmony. The fact that 24 is a multiple of 12 also made 24 EDO easy to achieve instrumentally by employing two traditional 12 EDO instruments purposely tuned a quarter-tone apart, such as two pianos, which also allowed each performer (or one performer playing a different piano with each hand) to read familiar 12-tone notation. Various composers including Charles Ives experimented with music for quarter-tone pianos. 23 EDO is the largest EDO that fails to approximate the 3rd, 5th, 7th, and 11th harmonics (3:2, 5:4, 7:4, 11:8) within 20 cents, making it attractive to microtonalists looking for unusual microtonal harmonic territory. 27 EDO is the smallest EDO that uniquely represents all intervals involving the first eight harmonics. It tempers out the septimal comma but not the syntonic comma. 29 EDO is the lowest number of equal divisions of the octave that produces a better perfect fifth than 12 EDO. Its major third is roughly as inaccurate as 12-TET; however, it is tuned 14 cents flat rather than 14 cents sharp. It tunes the 7th, 11th, and 13th harmonics flat as well, by roughly the same amount. This means intervals such as 7:5, 11:7, 13:11, etc., are all matched extremely well in 29-TET. 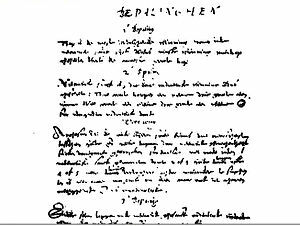 31 EDO was advocated by Christiaan Huygens and Adriaan Fokker. 31 EDO has a slightly less accurate fifth than 12 EDO, but provides near-just major thirds, and provides decent matches for harmonics up to at least 13, of which the seventh harmonic is particularly accurate. 34 EDO gives slightly less total combined errors of approximation to the 5-limit just ratios 3:2, 5:4, 6:5, and their inversions than 31 EDO does, although the approximation of 5:4 is worse. 34 EDO doesn't approximate ratios involving prime 7 well. It contains a 600-cent tritone, since it is an even-numbered EDO. 41 EDO is the second lowest number of equal divisions that produces a better perfect fifth than 12 EDO. Its major third is more accurate than 12 EDO and 29 EDO, about 6 cents flat. It's not meantone, so it distinguishes 10:9 and 9:8, unlike 31edo. It is more accurate in 13-limit than 31edo. 53 EDO is better at approximating the traditional just consonances than 12, 19 or 31 EDO, but has had only occasional use. Its extremely good perfect fifths make it interchangeable with an extended Pythagorean tuning, but it also accommodates schismatic temperament, and is sometimes used in Turkish music theory. It does not, however, fit the requirements of meantone temperaments, which put good thirds within easy reach via the cycle of fifths. In 53 EDO, the very consonant thirds would be reached instead by using a Pythagorean diminished fourth (C-F♭), as it is an example of schismatic temperament, just like 41 EDO. 72 EDO approximates many just intonation intervals well, even into the 7-limit and 11-limit, such as 7:4, 9:7, 11:5, 11:6 and 11:7. 72 EDO has been taught, written and performed in practice by Joe Maneri and his students (whose atonal inclinations typically avoid any reference to just intonation whatsoever). It can be considered an extension of 12 EDO because 72 is a multiple of 12. 72 EDO has a smallest interval that is six times smaller than the smallest interval of 12 EDO and therefore contains six copies of 12 EDO starting on different pitches. It also contains three copies of 24 EDO and two copies of 36 EDO, which are themselves multiples of 12 EDO. 72 EDO has also been criticized for its redundancy by retaining the poor approximations contained in 12 EDO, despite not needing them for any lower limits of just intonation (e.g. 5-limit). 96 EDO approximates all intervals within 6.25 cents, which is barely distinguishable. As an eightfold multiple of 12, it can be used fully like the common 12 EDO. It has been advocated by several composers, especially Julián Carrillo from 1924 to the 1940s. Other equal divisions of the octave that have found occasional use include, 15 EDO, 17 EDO, 19 EDO and 22 EDO. 2, 5, 12, 41, 53, 306, 665 and 15601 are denominators of first convergents of log2(3), so 2, 5, 12, 41, 53, 306, 665 and 15601 twelfths (and fifths), being in correspondent equal temperaments equal to an integer number of octaves, are better approximation of 2, 5, 12, 41, 53, 306, 665 and 15601 just twelfths/fifths than for any equal temperaments with less tones. 1, 2, 3, 5, 7, 12, 29, 41, 53, 200... (sequence A060528 in the OEIS) is the sequence of divisions of octave that provide better and better approximations of the perfect fifth. Related sequences contain divisions approximating other just intervals. This application:  calculates the frequencies, approximate cents, and MIDI pitch bend values for any systems of equal division of the octave. Note that 'rounded' and 'floored' produce the same MIDI pitch bend value. Alpha and Beta may be heard on the title track of her 1986 album Beauty in the Beast. In this section, semitone and whole tone may not have their usual 12-EDO meanings, as it discusses how they may be tempered in different ways from their just versions to produce desired relationships. Let the number of steps in a semitone be s, and the number of steps in a tone be t.
There is exactly one family of equal temperaments that fixes the semitone to any proper fraction of a whole tone, while keeping the notes in the right order (meaning that, for example, C, D, E, F, and F♯ are in ascending order if they preserve their usual relationships to C). That is, fixing q to a proper fraction in the relationship qt = s also defines a unique family of one equal temperament and its multiples that fulfil this relationship. For example, where k is an integer, 12k-EDO sets q = ​1⁄2, and 19k-EDO sets q = ​1⁄3. The smallest multiples in these families (e.g. 12 and 19 above) has the additional property of having no notes outside the circle of fifths. (This is not true in general; in 24-EDO, the half-sharps and half-flats are not in the circle of fifths generated starting from C.) The extreme cases are 5k-EDO, where q = 0 and the semitone becomes a unison, and 7k-EDO, where q = 1 and the semitone and tone are the same interval. Each choice of fraction q for the relationship results in exactly one equal temperament family, but the converse is not true: 47-EDO has two different semitones, where one is ​1⁄7 tone and the other is ​8⁄9, which are not complements of each other like in 19-EDO (​1⁄3 and ​2⁄3). Taking each semitone results in a different choice of perfect fifth. The diatonic tuning in twelve equal can be generalized to any regular diatonic tuning dividing the octave as a sequence of steps TTSTTTS (or a rotation of it) with all the T's and all the S's the same size and the S's smaller than the T's. In twelve equal the S is the semitone and is exactly half the size of the tone T. When the S's reduce to zero the result is TTTTT or a five-tone equal temperament, As the semitones get larger, eventually the steps are all the same size, and the result is in seven tone equal temperament. These two endpoints are not included as regular diatonic tunings. The notes in a regular diatonic tuning are connected together by a cycle of seven tempered fifths. The twelve-tone system similarly generalizes to a sequence CDCDDCDCDCDD (or a rotation of it) of chromatic and diatonic semitones connected together in a cycle of twelve fifths. In this case, seven equal is obtained in the limit as the size of C tends to zero and five equal is the limit as D tends to zero while twelve equal is of course the case C = D.
Some of the intermediate sizes of tones and semitones can also be generated in equal temperament systems. For instance if the diatonic semitone is double the size of the chromatic semitone, i.e. D = 2*C the result is nineteen equal with one step for the chromatic semitone, two steps for the diatonic semitone and three steps for the tone and the total number of steps 5*T + 2*S = 15 + 4 = 19 steps. The resulting twelve-tone system closely approximates to the historically important 1/3 comma meantone. If the chromatic semitone is two-thirds of the size of the diatonic semitone, i.e. C = (2/3)*D, the result is thirty one equal, with two steps for the chromatic semitone, three steps for the diatonic semitone, and five steps for the tone where 5*T + 2*S = 25 + 6 = 31 steps. The resulting twelve-tone system closely approximates to the historically important 1/4 comma meantone. ^ O'Donnell, Michael. "Perceptual Foundations of Sound". Retrieved 2017-03-11. ^ a b Fritz A. Kuttner. p. 163. ^ Fritz A. Kuttner. "Prince Chu Tsai-Yü's Life and Work: A Re-Evaluation of His Contribution to Equal Temperament Theory", p.200, Ethnomusicology, Vol. 19, No. 2 (May 1975), pp. 163–206. ^ a b Robinson, Kenneth G., and Joseph Needham. 1962. "Physics and Physical Technology". In Science and Civilisation in China, vol. 4: "Physics and Physical Technology", Part 1: "Physics", edited by Joseph Needham. Cambridge: University Press. p. 221. ^ Fritz A. Kuttner. p. 200. ^ 有关"七平均律"新文献著作的发现 [Findings of new literatures concerning the hepta – equal temperament] (in Chinese). Archived from the original on 2007-10-27. 'Hepta-equal temperament' in our folk music has always been a controversial issue. ^ 七平均律"琐谈--兼及旧式均孔曲笛制作与转调 [abstract of About "Seven- equal- tuning System"] (in Chinese). From the flute for two thousand years of the production process, and the Japanese shakuhachi remaining in the production of Sui and Tang Dynasties and the actual temperament, identification of people using the so-called 'Seven Laws' at least two thousand years of history; and decided that this law system associated with the flute law. ^ "Quantifying Ritual: Political Cosmology, Courtly Music, and Precision Mathematics in Seventeenth-Century China Roger Hart Departments of History and Asian Studies, University of Texas, Austin". Uts.cc.utexas.edu. Archived from the original on 2012-03-05. Retrieved 2012-03-20. ^ a b "EQUAL TEMPERAMENT". University of Houston. Retrieved 2014-10-05. ^ True, Timothy (2018). "The Battle Between Impeccable Intonation and Maximized Modulation". Musical Offerings. 9 (2): 61–74. doi:10.15385/jmo.2018.9.2.2. ^ Galilei, V. (1584). Il Fronimo... Dialogo sopra l'arte del bene intavolare. G. Scotto: Venice, ff. 80–89. ^ "Resound – Corruption of Music". Philresound.co.uk. Retrieved 2012-03-20. ^ "Spinacino 1507a: Thematic Index". Appalachian State University. Archived from the original on 2011-07-25. Retrieved 2012-06-14. ^ "Van de Spiegheling der singconst, ed by Rudolf Rasch, The Diapason Press". Diapason.xentonic.org. 2009-06-30. Retrieved 2012-03-20. ^ Di Veroli, Claudio. Unequal Temperaments: Theory, History and Practice. 2nd edition, Bray Baroque, Bray, Ireland 2009, pp. 140, 142 and 256. ^ Moody, Richard. "Early Equal Temperament, An Aural Perspective: Claude Montal 1836" in Piano Technicians Journal. Kansas City, USA, Feb. 2003. ^ Helmholtz, Hermann L.F. Lehre von den Tonempfindungen… Heidelberg 1862. English edition: On the Sensations of Tone, Longmans, London, 1885, p.548. ^ White, William Braid. Piano Tuning and Allied Arts. 1917, 5th enlarged edition, Tuners Supply Co., Boston 1946, p.68. ^ Partch, Harry (1979). Genesis of a Music (2nd ed.). Da Capo Press. p. 134. ISBN 0-306-80106-X. ^ Cordier, Serge. "Le tempérament égal à quintes justes" (in French). Association pour la Recherche et le Développement de la Musique. Retrieved 2010-06-02. ^ Morton, David (1980). "The Music of Thailand", Musics of Many Cultures, p.70. May, Elizabeth, ed. ISBN 0-520-04778-8. ^ Myles Leigh Skinner (2007). Toward a Quarter-tone Syntax: Analyses of Selected Works by Blackwood, Haba, Ives, and Wyschnegradsky, p.55. ISBN 9780542998478. ^ Monzo, Joe (2005). "Equal-Temperament". Tonalsoft Encyclopedia of Microtonal Music Theory. Joe Monzo. Retrieved 26 February 2019. ^ "665edo". xenoharmonic (microtonal wiki). Retrieved 2014-06-18. ^ "convergents(log2(3), 10)". WolframAlpha. Retrieved 2014-06-18. ^ Carlos, Wendy. "Three Asymmetric Divisions of the Octave". wendycarlos.com. Serendip LLC. Retrieved 2016-09-01. ^ Milne, A., Sethares, W.A. and Plamondon, J.,"Isomorphic Controllers and Dynamic Tuning: Invariant Fingerings Across a Tuning Continuum" Archived 2016-01-09 at the Wayback Machine, Computer Music Journal, Winter 2007, Vol. 31, No. 4, Pages 15-32. Cho, Gene Jinsiong. (2003). The Discovery of Musical Equal Temperament in China and Europe in the Sixteenth Century. Lewiston, NY: Edwin Mellen Press. Duffin, Ross W. How Equal Temperament Ruined Harmony (and Why You Should Care). W.W.Norton & Company, 2007. Sethares, William A. (2005). Tuning, Timbre, Spectrum, Scale (2nd ed.). London: Springer-Verlag. ISBN 1-85233-797-4. Surjodiningrat, W., Sudarjana, P.J., and Susanto, A. (1972) Tone measurements of outstanding Javanese gamelans in Jogjakarta and Surakarta, Gadjah Mada University Press, Jogjakarta 1972. Cited on http://web.telia.com/~u57011259/pelog_main.htm. Retrieved May 19, 2006. Fractal Microtonal Music, Jim Kukula. Dominic Eckersley: "Rosetta Revisited: Bach's Very Ordinary Temperament"